The best way to know and learn more about the marine ecosystem is through spaces designated to educate about the importance of every specie on the planet. The Interactive Aquarium of Cancun accomplishes this important function, learn more about it. 12.5 km away from the Hotel Zone of Cancun is the mall La Isla, where the Cancun Interactive Aquarium is located, which is easy to get to for tourists who want to discover the mysteries hidden in the depth of the ocean. Here it is possible touch some of the species if you want to, you can also try swimming with dolphins in Mexico!, touch them and hug them, play with them and get to know them from a very close perspective, only then will you notice how extraordinary they are. Fishbowl Area: here you can see the different species and marine corals that live in this place up close. Contact Area: in this zone you can touch the rays, feed them or hold a starfish in your hands, can you imagine that? 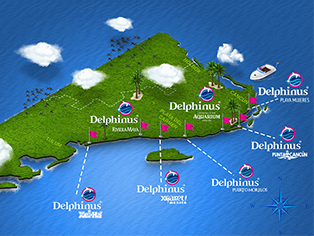 Dolphins Area: here you will see the Aquarium’s protagonist and also see what the experience of swimming with dolphins is like. You will notice the magnificence of the planet’s most intelligent marine mammal. This Aquarium is ideal for kids because they will live a complete marine experience. We recommend that you arrive early so you can wander around with calm and enjoy everything there is to offer, you will enjoy a unique and ludic experience. A good way to end your visit of the Aquarium is by swimming with dolphins in Mexico, where you will enjoy a moment that you will remember for a long time. Come visit the one and only Interactive Aquarium of Cancun.